Florida’s good neighbor award may go to developer Time Equities this year. The firm planned to redevelop an aging office park on a 10-acre site south of downtown West Palm Beach into $1+ million luxury condos. After the community voiced concerns over initial plans for 15-story contemporary towers designed by Helmut Jahn, the developer turned to Miami’s MSA Architects for something completely different. Plans were approved and construction is underway for a cluster of low-rise apartment buildings with some ground floor retail. The layout includes three 3-story buildings with street-level shops along Dixie Highway and three 5-story buildings, bringing the total number of apartments to 300. The new design is Spanish eclectic style to blend with the surrounding Mediterranean-style homes. Time Equities wanted the development to have broad appeal with an emphasis on child-friendly features – good for young families and older residents hosting visiting grandkids. Amenities include a 2-story clubhouse, resort-style infinity pool, children’s room, game room, private dining room, children’s pool, dog park and children’s park, and a community garden. 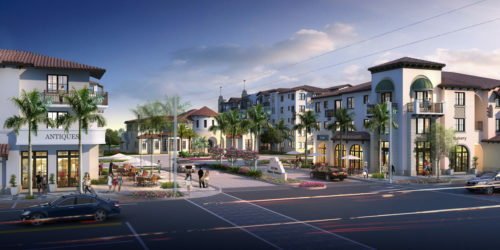 PRISM worked with MSA Architects on the renderings used to communicate the new design details to the community. The reception was overwhelmingly positive. “It’s fabulous,” said Nancy Pullum, leader of Citizens for Thoughtful Growth. “What they came back with is a credit to them. I think we have a project we can all be proud of.” Completion is expected in mid-2021.